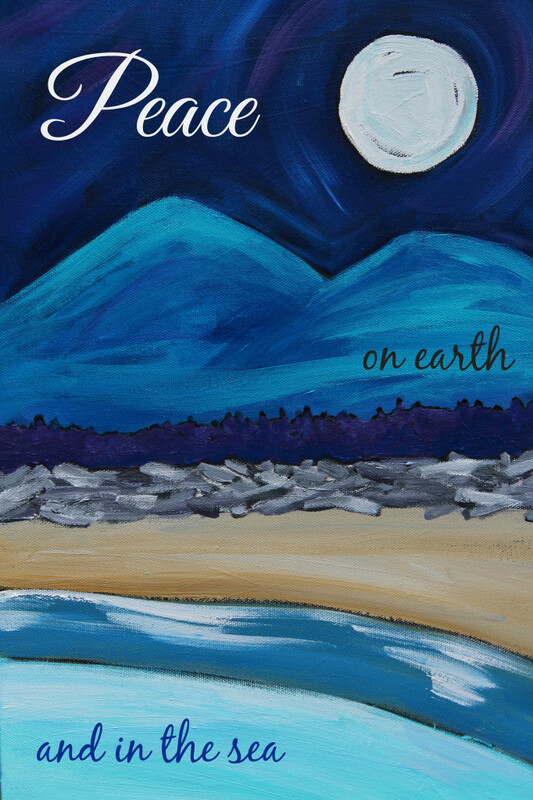 This entry was posted in Uncategorized and tagged christmas, moon, ocean, painting by admin. Bookmark the permalink. First was close but not the middle one. thanks…I will tally the votes and we will see which one comes in the mail! let’s keep holiday mail alive!! I like #1, followed by #3. I really like all the fonts, and prefer the placement of 1 & 3. I feel like in 1 & 3 the message encompasses all that’s in between the words, from sky to sea, 2 feels like land to sea. Really can’t decide between the fonts though, they’re all perfect! Beautiful work as usual Christy! I love how you have interpreted the word placement so deeply. Thank you for your thoughtful comments! I am leaning to 4 right now too, but based on the feedback I am getting I may print a couple of the top choices and let those that order decide on a custom set! (how is that for avoiding a decision!)? thanks for stopping by Shelley! I choose the first one. Calming font.,.. thanks! many are saying the same of that one. All beautiful but 3 is my fave. so hard to pic, isn’t it!? thanks Pat! thank you Karen! I will contact you re: orders! The first and third are my favs, can I order a doz? happy to take orders, will send you an email! I like the first one best, 4th is nice but script is a little overpowering..
thanks for checking in Doreen and for your kind words! thank you all for your feedback! let’s keep holiday mail alive! #1 and #4 – adore! #4 – PEACE comes across as THE message – and then the “places” of peace. My top picks are 1 & 3. So hard to pick!